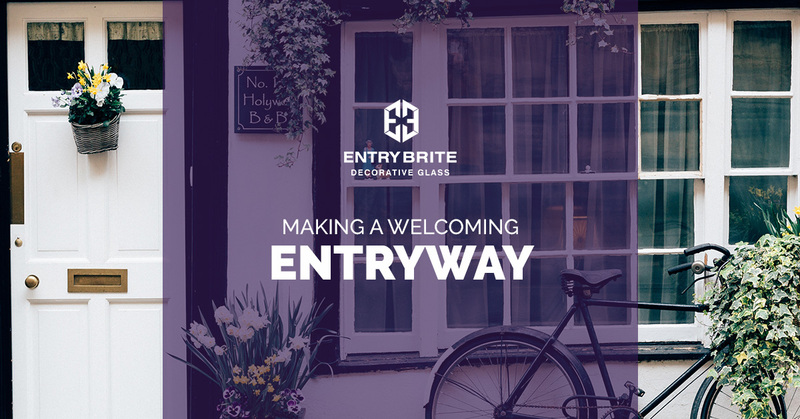 At Entry Brite, we offer homeowners in Las Vegas to completely transform their homes with our custom-made stained glass products. From providing accent windows in your kitchen and interior doors, to completely remodeling your front entryway, our artisans and craftsmen can help you create a home that feels inviting and warm. In today’s blog, we’ll discuss ways you can make your front entryway more welcoming. For the most parts, modern homes lack a true front room or foyer. Instead, often upon stepping into the entryway of the home, a guest can immediately view the staircase that leads up to the next floor, or directly into the kitchen or living room. Rather than allowing a guest’s eyes to immediately take all of these features in, give them a piece to focus on. A small table with a piece of artwork on it might be an appropriate addition to a one-story home. For homes with a flight of stairs by the front door, find a way to add art or decorations to the side of the staircase. That way, if your guest’s eyes are drawn up to the second floor, they’re looking at the art, and not the stairs themselves. The size and scale of your entryway should influence how you decorate and accent the space. If you have a large open entryway, you can add furniture like end tables, small couches or chairs, even mirrors or paintings. However, in a smaller entryway, these features would only serve to clutter the entrance, making it difficult to get in and out of your home. In smaller spaces, you might have a smaller table, a stool that your guest can sit on to take off their shoes, or even a small coat rack. The most welcoming homes have a shared theme or decoration scheme across the entire house. Your entryway can serve as an introduction to your homes aesthetic. So, if your home has a sort of rustic, craftsman look to it, and you’ve matched your furniture and accessories to that look, your entryway should too. If your front entryway is decorated differently than the rest of your home, this might be a visually jarring transition for your guest. Some homeowners shy away from adding rugs to their entryway because that space sees so much use, and can quickly dirty a rug. However, rugs make a fine addition to any entryway. Not only does it really tie the room together with a complex pattern, or colors that match the paint on your walls, the softness of a rug will be a welcome luxury for your guest’s feet if they’ve been traveling. While creating a barrier between your guest and the rooms of your home may not sound welcoming, you can do so with fun fixtures and furniture. If your entryway opens up directly to your living room, for instance, you can set up a small bookshelf and lamp in the entry. This will add definition to the space allowing you the chance to guide your guest to a sitting room or entertaining area. Natural light instantly makes any room feel warmer, more inviting, and larger as well. Your guest will feel comfortable if they step into an entryway that is well lit. Not only will they be able to see clearly, they’ll also be able to take in your home’s decor more readily. Of course, the best way to bring more light into a space is through the use of custom-made stained glass windows and door inserts from Entry Brite! If your town or city is known for a specific style, industry, or craft, show off these features in your entryway. It’s a fun way to incorporate motifs that your guest might have seen around town and provides an aesthetic cohesiveness between your home and the neighborhood. If you’re interested in remodeling the entryway in your Las Vegas home, contact the remodeling specialists at Entry Brite. With years of experience, we’ll listen to your vision and interests during our consultation, and then develop a beautiful new entryway for you. From new doors to decorative stained glass, we can make any space more welcoming. Contact us today!